The winter can bring frozen temperatures and brutal driving conditions. It can be very dangerous to navigate highways during a storm. No matter what route you’re taking or what you’re transporting, it’s always better to be prepared for winter. Have an emergency kit ready: In your truck, make sure you have a first-aid kit, blankets, dry goods (granola bars etc. ), water, blankets and flares. If you get stuck in your rig during a storm, you’ll have enough food and water to get you through it. Slow down: No matter what your deadline is, when a storm hits and the driving conditions are less than favourable, you need to slow down. Shipments and pickups can be late under these circumstances. There’s no need to rush. The last thing you want to do is get into a collision with another vehicle because you were trying to speed through a storm. Take your time and drive carefully. Put your flashers on and go below the speed limit if necessary. You’ll get to your destination when you get there, plus you’ll be safe which is all that matters. Don’t stop on the shoulder if possible: When the visibility is low and the snow is swirling to the point that it is blinding, don’t pull over onto the shoulder. Maintain a slow and steady speed and wait until the next exit to get off the road. When you pull onto the shoulder to wait out a storm, other vehicles can slam into the back of your rig because they can’t see properly. They may see your taillights and think you’re on the road when you’re actually on the shoulder. Keep a safe distance from other vehicles: When traveling in the winter, leave enough room between your vehicle and the one in front of you. Try to keep approximately ¼ mile distance even if you can’t see the lines on the road due to horrible weather conditions. Make sure your equipment works: If you must drive in whiteout conditions, stop frequently and ensure you have enough fuel and that your lights are in good working order. If it looks bad outside, it is: No job is worth losing your life over. Your employer will understand if shipments are delayed because of bad weather. In the end, your life is more valuable than the load you are transporting and your employer and their clients know that. Don’t forget to breathe: In an emergency, we often forget to breathe which only causes more distress. Remember to breathe and do your best not to panic. Focus on calming yourself down and you will come out of any emergency unscathed. 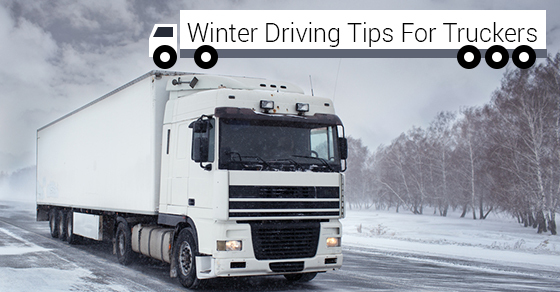 Winter driving can be very dangerous, especially when you’re driving a truck through mountainous and unknown highways. The important thing to remember about driving in whiteout weather is to stay alert and if you feel you can’t continue, pull over at the next exit and wait out the storm.